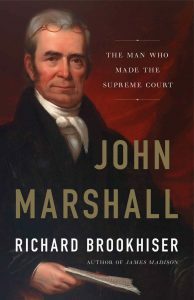 Historian and biographer Richard Brookhiser offers here a moderately short, easy to read, and quite in-depth review of Supreme Court Chief Justice John Marshall’s career and legal philosophy. First a word on the book’s structure, which is at times jarring, especially if you’re expecting a biography of the trivia-laden, almost-voyeuristic sort. That is not this book. Instead, little vignettes of Marshall’s personal and domestic life are interspersed with much larger passages about political disputes and legal cases in which Marshall took part. The smaller passages often involve private letters, rumors, and gossip, which are sometimes humorous and which humanize the Founders, who were not above such things. Marshall’s character is thinly but sufficiently filled in. He was a Revolutionary War veteran who fought alongside George Washington, and was completely devoted to Washington and his Federalist political philosophy. Marshall was a simple country Virginian who, if he were alive today, would probably appear as a fake populist. In one possibly apocryphal anecdote, a man who was searching for a lawyer spotted Marshall in a “plain linen shirt, picking cherries out of his hat and eating them.” He hired a more professional-looking lawyer, only to discover at the courthouse that his opponent’s lawyer was none other than Marshall. After observing the two lawyers argue, the man resolved to hire Marshall in the future. Many other stories draw a picture of Marshall as a man who was surely among the elite, but not an elitist. Another salutary trait was, in Brookhiser’s words, “the gift, essential to good citizenship, of admiring greatness without forfeiting his own manhood.” Marshall had an enduring tendency to convince rather than bully, to build a consensus—based on his own opinion, of course—rather than railroading all other opinions. He was politically astute and “showed a gift for careful, neutral-seeming language that served a larger goal,” but does not come off appearing as a conniver or political hack. His desire for consensus was connected to his view of the Court as “an organism.… he wanted its judgments to be oracular.” This may seem grandiose, but the context was a chaotic America that lacked a coherent and respected legal system. Bridging the categories of personal and professional attributes was Marshall’s intense dislike of Thomas Jefferson, who became his chief political nemesis (and who was also, as fate would have it, his cousin). Jefferson was the young republic’s most prominent anti-Federalist, and aside from Washington and Hamilton, Marshall was its most ardent Federalist. What turns out to be more interesting than any of the biographical details are the explications of the big constitutional and political questions of the day. Most of these issues and cases—contracts, judicial review, interstate commerce—will be at least faintly familiar to anyone who paid attention in history class. But John Marshall goes much deeper, and gives the surrounding context of these early legal controversies, rather than serving them up as little unrelated episodes à la History 101. It is rare to find such readable and intelligible writing on legal issues, and this is where John Marshall really shines. The particular debates that raged are also fascinating. The most interesting might have been the question of the nature of the union: whether it was merely a compact of sovereign states, which would implicitly allow for secession, or a permanent of union formed by the people of every state as Americans, rather than by the states themselves. Brookhiser notes that “country” often meant “state” in the early days. It is barely an exaggeration to say that early America literally did know if it was a country. Another interesting debate was over the nature of interstate commerce: whether the interstate economy was a single national entity (giving more power to Congress), à la Hamilton, or a more distributed phenomenon (bunting more power to the states). Much is familiar to anyone who follows politics today. There were early spats about collusion or unwarranted loyalty (to Britain and France); there was the ever-confusing process of every state administering presidential elections a little bit differently; there was, in the early 1820s, already the sentiment that Washington, DC was a cruel and heartless place. Cases, including the landmark Fletcher v. Peck, were “arranged” deliberately in order to settle a legal or constitutional dispute. There was a debate in Trustees of Dartmouth College v. Woodward, bringing to mind Citizens United and its associated rhetoric, over whether the state’s role in chartering corporations gave it special control over them (Marshall concluded not). There were broader debates over whether the Constitution merely described pre-existing rights, or granted them. Some of the ideas then in the air are extreme even today; Kentucky Senator Richard Johnson denounced bans on Sunday mail delivery as an unconstitutional establishment of religion. Some of the Hamiltonian/Federalist views on business and economics veered into what many conservatives would call central planning, while Jefferson proposed that contracts should expire after a generation (which brings to mind the Chinese seventy-year land lease, a means of allowing de facto but not de jure private property). John Adams, not to be outdone, hypothesized in a newspaper column that hereditary succession in the presidency might be preferable to elections. Early America could at times be downright authoritarian. There are of course the infamous Alien and Sedition Acts, the latter of which was intended to punish hostile journalists. But there was also a Georgia law, passed during the Indian conflicts of the early 1830s, which resulted in the imprisonment of Christian missionaries working with the Cherokee Indians.